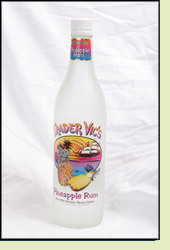 Andy: Trader Vic’s Pineapple Rum has a real sweet but natural pineapple taste. It’s one of the better pineapple rums I’ve sampled. Very good and inexpensive. Adrian: This tastes like the syrup that canned pineapple comes packed in. I would definitely recommend it as it has a real natural flavor.